waiting for the splitter's wedge. We are gathering wood from the land ready for splitting, some for the house fire over winter, but also to fire the small kiln. 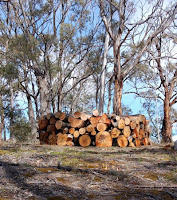 Our land has mostly black wattle, peppermint and blue gum and we use it all in various ways - if not as fuel in the kiln then the ash from the house fires is slaked, sieved and dried as a glaze ingredient. In the new year it will be dolerite, fat sand, sandstone and ochre that we gather as slowly the materials are prepared for the autumn firing. I work as a potter, exploring and expressing a connection to place through the use of local materials. That place is the South Arm peninsula in south-eastern Tasmania. On the edge of the southern ocean, this is a place of eroded cliffs, refracted ocean swells, rock stacks and the linear natural and human patterning of the tidal zone. The stimulus of my life here is explored through journal poetics and photographs, then expressed in fired clay utensils - a.k.a. pots.